Fig. III-37 shows the number of juvenile probationers and parolees from juvenile training schools newly received by probation offices since 1949 (see Appendix II-12 ). 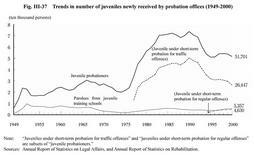 The number of juvenile probationers newly received by probation offices increased drastically from 1977, when short-term probation for traffic offenses was introduced. The number remained at around 70,000 from 1983 but started to decrease in 1991. Although it turned up in 1996 as the scheme for short-term probation for regular offenses was introduced in September 1994, it has been decreasing again since 1999. In 2000, the number declined by 2,155 (down 4.0%) from the previous year to 51,701. This was caused by the decline of the number newly accepted to the short-term probation for traffic offenses, and the number declined by 3,237 (10.9%) from the previous year. Parolees from juvenile training schools also increased from 1977, partly due to the introduction of short-term treatment in juvenile training schools, but continued a downward trend from the late 1980s. It turned upwards, however, in 1997 and increased by 170 (up 3.3%)from the previous year to 5,357 in 2000.